"We're playing Thanksgiving. She's the mommy, she's the daddy, and I'm the alcoholic, cult-worshiping, satanic step-mother." Thanksgiving is, in the realm of holidays, a bit unique in that it is wholly national, without any affiliations. It's not religious or ethnic, but uniquely American. Families come together to give thanks, something accomplishable by anyone, regardless of race, creed, or color. It's the perfect holiday, all-inclusive, and full of food and family. What's Cooking? celebrates the diversity of Thanksgiving with an interlocking look at four American families: one Jewish, one Vietnamese, one African American, and one Hispanic. All four families celebrate Thanksgiving with the traditional turkey, but they augment it according to their backgrounds. A daughter in the Vietnamese family, watching as her mother spreads chili powder onto the bird, asks, "Why do you want to make the turkey taste like everything else we eat?" The Latino family serves flan along with the pumpkin pie, and the African American family eats macaroni and cheese. The meals reflect the diversity of their ethnicity, but also the unity of their common celebration. Each family is coming together, but not without having to deal with long simmering tensions. The Vietnamese mother (Joan Chen) is unable to relate to her children; she fears one is sexually active and another may be involved in a gang. Meanwhile, in both the African American family and the Hispanic American family, the heads of the household have been separated due to infidelity—Alfre Woodard must bridge the gap between her rebellious son and her unfaithful spouse, and Mercedes Ruehl must deal with an unexpected guest at the table—her estranged husband. The Jewish family must deal with the realization that one of their own (a daughter, played by Kyra Sedgwick) is gay, and that she's living with a girlfriend (Julianna Margulies). Each of these plot threads connect in some way. A son from the Vietnamese family (Jimmy) is unable to return home because he is visiting with the family of his girlfriend (a member of the Latino brood). They all finally come together in a rather pleasant way, in a twist that I wouldn't call a surprise ending, but maybe a welcome surprise. After all, as the film illustrates, despite their differences, these families all are dealing with the same sorts of problems: the generation gap, and an argumentative Thanksgiving—neither one unique to one particular culture. Writer director Gurinder Chadha is an Indian woman with Kenyan roots, born and raised in England, and married to co-writer Paul Berges, himself half-Japanese. The two subvert the usual stereotypes with their blend of ethnic backgrounds, and they do the same with the film. No family is presented stereotypically, except perhaps by members of other races (as when one of the Latino boys tries to relate to Jimmy by discussing the merits of Bruce Lee and Jackie Chan). The focus is not on "The Vietnamese Thanksgiving," but on the celebration of a Vietnamese family on Thanksgiving. A subtle, but significant, difference. The cast is quite impressive, with cameos from, among others, Estelle Harris, and it is uniformly excellent. At times, the story is paced a bit clumsily, even choppy, and some of the arguments seem a bit clichéd (especially one about gun control), but the characters are so colorful and full of life, any narrative missteps are easy to excuse. Though it deals with troubled families, What's Cooking? isn't a movie about arguments and confrontations, but a glimpse of unique American families celebrating a uniquely American holiday. Image Transfer Review: Overall, this film looks very good on DVD. The colors seem true to the director's intent, at times a bit dull, and then in the next scene, rich and saturated. There isn't much noticeable edge-enhancement, and a bit of digital artifacting does little to mar the overall presentation. The black level isn't what I'd call stellar, but it is certainly serviceable. Audio Transfer Review: What's Cooking? didn't require a dynamic sound mix, and it sure didn't receive one. That's not to say this track is poor; it suits the film perfectly. Just don't expect a lot of action in the surrounds. Most importantly, the dialogue is always clean, clear, and natural, with no obvious ADR. The score fills out the front soundstage to good effect, but rarely does it venture into the surrounds. In fact, I only noticed surround use for certain, more boisterous passages of music, and some of the large party scenes. Extras Review: What's Cooking? Well, some decent supplements, for one thing. First of all, there is a nice commentary track with the director and co-screenwriter. The two are very talkative and engaging throughout. They discuss character motivation, on-set anecdotes, and the overall themes of the film, all without becoming dry, boring, or overly pretentious. Cast and crew interviews are also provided, broken down into individual topics. Basically, these segments consist of poorly edited PR interviews with the director and actors (they keeping making comments like, "I don't want to give anything away, but..."). Some of the information is illuminating, but you can really tell these were off-the-cuff and during the shoot, because some of the actors don't have much of interest to say, and they babble incessantly without making a coherent point. Some of the categories are a bit questionable; for instance, one subhead is "Working with Juliana Margulies: from her Lesbian Lover, Kyra Sedgwick," which is odd phrasing, to say the least. 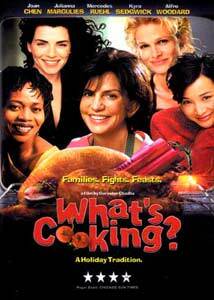 Rounding out the disc are the trailer and a series of text screens that provide the recipes for the various ethnic dishes featured in the film. What's Cooking? is a very busy movie, and at times it loses hold of its coherent narrative, but it the end, it is a rewarding look at the not-so-traditional American family. Trimark has done a decent job with the DVD, and there are some illuminating supplements. Worth a rental before next Thanksgiving.